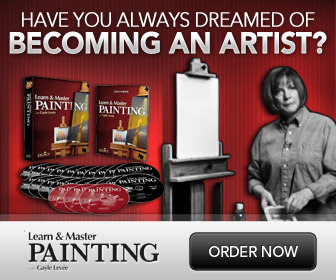 Below is an excellent step by step oil painting video lesson by the very talented Debra Bryant. I found the following oil painting demonstration on the video sharing site Ustream.tv. This is a very long demo with over 3 hours of footage. So grab your favorite beverage or snack, sit back relax and be prepared to learn something new. In this oil painting lesson, Debra shares her oil painting techniques for creating a beautiful landscape painting from a photo. She begins her painting by first toning her canvas with purple so that this color will show through the final painting in spots. She demonstrates her techniques for creating a convincing sky and clouds. One key technique that she points out in the video for doing this is to make the sky more green near the horizon. To make realistic looking clouds, she mixes reds and yellows into white. Also, when clouds near the horizon, they become narrower and more gray. These are just some of the awesome techniques you will learn in this video. Enjoy! Follow this link to visit Debra’s Ustream Profile for more awesome Painting Demonstrations. Follow this link to visit Debra’s Blog.